Up to one-third of domestic violence victims in one study said they delayed the decision to enter a shelter out of concern for their pets' welfare. But, according to some estimates, only about 3% of domestic violence shelters nationwide can accommodate pets. (CNN and KGTV) - Up to one-third of domestic violence victims in one study said they delayed the decision to enter a shelter out of concern for their pets' welfare. But, according to some estimates, only about 3% of domestic violence shelters nationwide can accommodate pets. The Pets and Women Safety Act, or PAWs, was passed with bipartisan support as part of the farm bill -- legislation that addresses a wide range of areas, including farming, nutrition, conservation, trade, energy and forestry. "No one should have to make the choice between finding safety and staying in a violent situation to protect their pet," said Democratic Caucus vice chair and Rep. Katherine Clark of Massachusetts, who co-sponsored the bill. 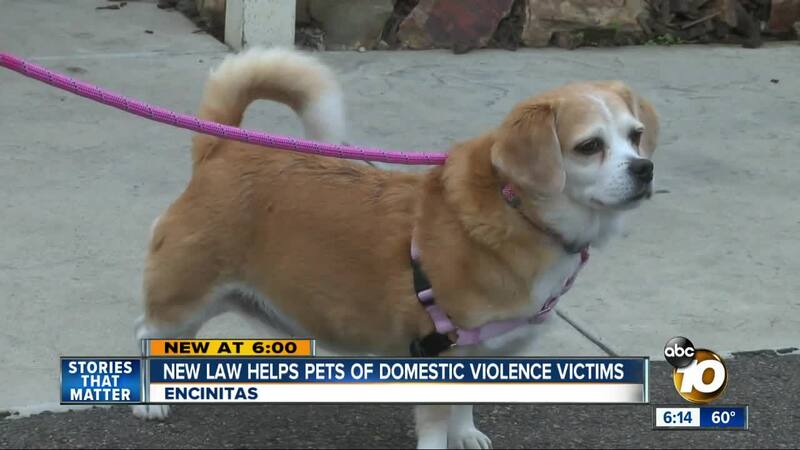 "This law empowers survivors with the resources to leave a dangerous situation while being able to continue to care for their pet. I'm grateful for the partnerships we've formed between organizations working to end both domestic violence and animal abuse. Together, we will help save lives." PAWS mimics legislation in 33 states, plus the nation's capital and Puerto Rico, that include various protections for pets in domestic violence orders and funding for sheltering. "They will do anything to protect their animals because often that pet is often the only positive thing in their lives," she said. 10News met Amber at the Rancho Coastal Humane Society. Amber says her husband became physically abusive toward her and her two dogs starting about two-and-a-half years ago. One of the reasons she didn't leave : The safety of her dogs. "I didn't trust him alone with the dogs. I didn't feel comfortable leaving them in his care," said Amber. She found the Animal Safehouse program at Rancho Coastal Humane Society, which helps pet owners in crisis. Most of them domestic violence survivors. While her dogs stayed at the facility, Amber got a protective order against her husband, before entering a month-long treatment for PTSD related to domestic violence. The new law could expand options for domestic violence victims looking to leave their situation. The measure also calls for amending the definition of stalking in federal criminal code to include "conduct that causes a person to experience a reasonable fear of death or serious bodily injury to his or her pet."